This coat arrived quickly and looking exactly as pictured, we love be M.K. products. My only criticism complaint on this coat is that the hood is a bit too oversized, with that being said the rest of the coat fits well and looks great too. 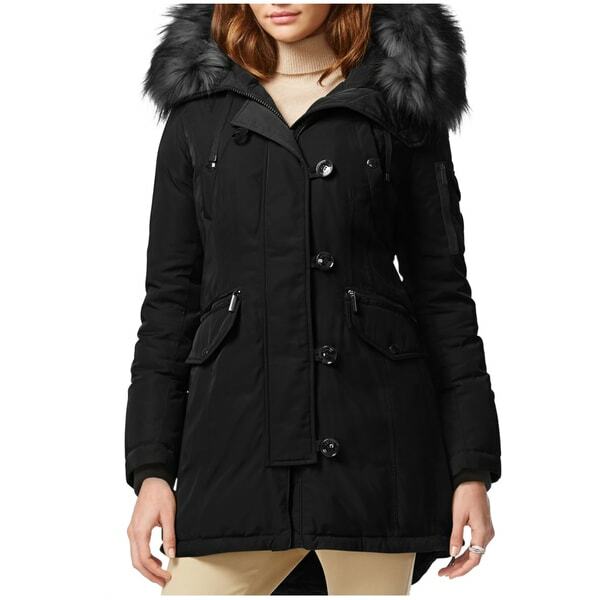 Stay warm while keeping your style in check with this Michael Kors black parka coat. This coat has a front zipper with a button storm flap, making it easier to put on or take off. This jacket does not disappoint. With cold Chicago winters this coat keeps me nice and warm. It’s also nice that the faux fur is removable. I get a lot of compliments on it. It’s the same jacket in the department stores- so glad I found it on overstock. I did not like this coat at all. The fit was wrong and for the money you would do better with a North Face parka. I found it to run large and the fur was not as full as shown. "Can this parka b ordered in an XL? Thank you." Size XL is not available at this time. "does the coat have a metal or plastic zipper?"